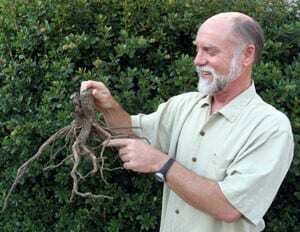 In this webinar based upon Robert Kourik’s two books on the subject, Understanding Roots: Exploring Plants Underground uncovers one of the greatest mysteries below the soil surface―the secret lives and magical workings of the roots that move and grow invisibly beneath our feet. Roots do more than just keep a plant from falling over: they gather water and nutrients, exude wondrous elixirs to create good soil, make friends with microbes and fungi, communicate with other roots, and adapt themselves to all manner of soils, winds, and climates, nourishing and sustaining our gardens, lawns, and woodlands. During the presentation, Kourik will share enchanting and revealing root drawings, from prairies, grasslands, and deserts, as well as drawings based on excavations of vegetable, fruit, nut, and ornamental tree roots. Through detailed illustrations, Kourik will describe how roots work their magic to improve soil nutrients and will discuss soil microbes and their mysterious relationship to roots. This presentation will also explore the question of whether deep roots really gather more unique nutrients than shallow roots. Kourik will explain the latest research about the mysteries of mycorrhizal (good fungal) association. Practical tips will provide guidance on the use of inputs such as fertilizer, compost, water, and mulch to help plants flourish. Robert Kourik credits the School of Hard Knocks for much of his early life skills training (and numerous continuing-education credits). He learned various horticulture-related skills from the inside-out by working with clients throughout California and the rest of the country for over 25 years. During that time Kourik took on design projects of all sizes, shapes and textures—water gardens, paths and patios, elegant arbors, habitat gardens, innovative home playgrounds, outdoor barbecue areas, deer-resistant gardens and low-profile, attractive deer fences, to name just a few. In the late 1970s, with only a high school diploma, Kourik wrote a landscape book which has become a classic in its field and helped to define the genera of gardening now known as edible landscaping. Kourik believes that it was a lack of formal college training in horticulture that allowed him to envision and interpret this new interdisciplinary and original approach to gardening and landscaping. 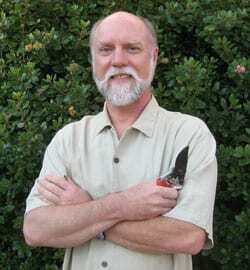 Throughout his career, Kourik has focused primarily on organic, natural, sustainable, integrated systems, permaculture and appropriate horticulture methods. Kourik is the author of several books including: Designing and Maintaining Your Edible Landscape Naturally; Roots Demystified; Drip Irrigation for Every Landscape and all Climates; and just published, Understanding Roots. Robert writes and interacts with landscapes in the San Francisco Bay area in California.